The ASP-9800 Professional Mixing Amplifier with Speaker Package from VocoPro is complete with everything necessary for professional DJ, karaoke and VJ applications. The system includes the powerful DA-9800RV Karaoke Mixing Amplifier that provides 600W of power at 4 ohms and enough connections to accommodate a Karaoke media player, wireless microphone system and consumer audio / video components for install in home theaters, restaurants, bars, etc. The package also comes with a set of 2 VX-12 speakers with SS-88 stands and speaker cables. 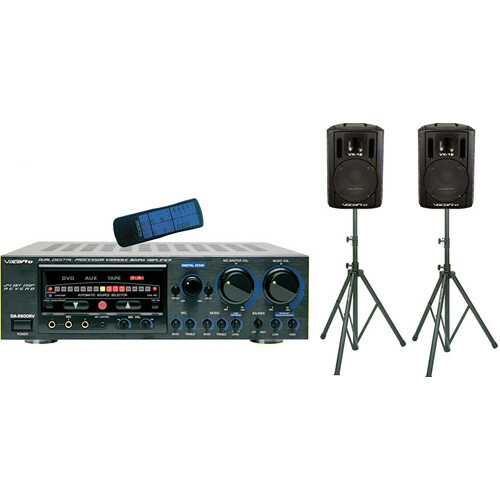 The VocoPro DA-9800RV is a karaoke mixing amplifier offering 600 watts of peak power at 4 Ohms and enough connections to accommodate a karaoke media player, wireless microphone system, and consumer audio/video components, for installation in home theaters, restaurants, bars, etc. While suitable for basic consumer home theater applications, the DA-9800RV hosts an array of karaoke-specific features including a built-in effects processor with reverb and echo effects, a vocal enhancer, 15-step digital key control, six 1/4" microphone inputs, and selectable vocal cancellation. Use the DA-9800RV to interface microphones, video, line-level audio sources, display, monitors, power amplifiers, speakers, and more. It includes a remote control with batteries for access to key control, mic/music volume, input selection, and other controls. The VX-12 Professional 12" 2-Way 500W Vocal Speaker from VocoPro produces clean sound, thanks to the 12" driver and 8 ohm impedance. Specifically designed to deliver optimum, professional-quality vocals all throughout the club and party, this sturdy unit comes with a built-in handle that allows easy transport. The speaker is stand mountable for better room placement. Box Dimensions (LxWxH) 21.0 x 18.0 x 9.0"
Box Dimensions (LxWxH) 28.0 x 20.0 x 17.0"